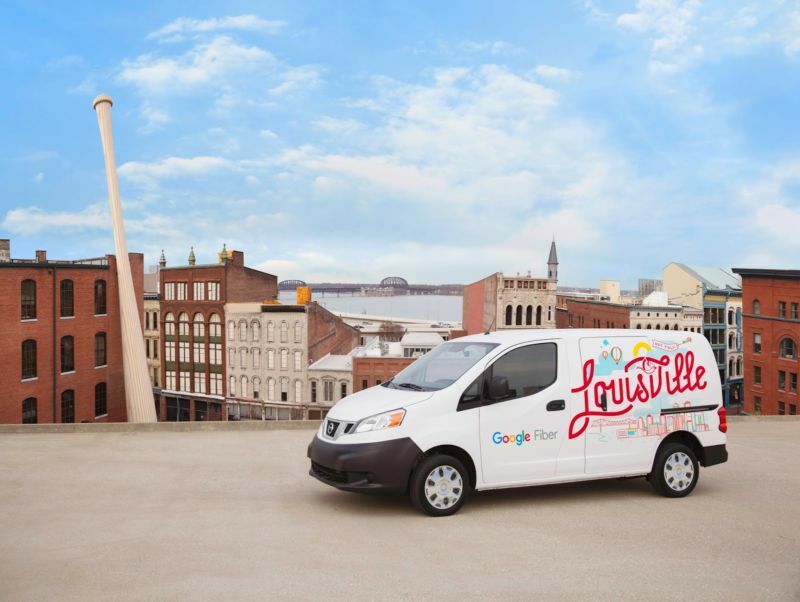 A Google Fiber van in Louisville. Google Fiber yesterday shut off service in Louisville, Kentucky, and has agreed to pay the local government $3.84 million to remove exposed fiber cables left behind by the ISP’s failed nano-trenching experiment. Google Fiber service was scheduled to be shut off at midnight last night, according to a Louisville Metro Government (LMG) announcement of the exit agreement. Google Fiber had announced its intention to leave Louisville two months ago, admitting that it did such a bad job with fiber installation that it would have to “essentially rebuild [the] entire network” in order to fix the problems. In Louisville, Google Fiber reportedly was burying cables in nano-trenches that were just two inches deep. The method was supposed to speed up deployment, but it didn’t work as Google Fiber expected. Google Fiber’s payments totaling $3.84 million will be made over 20 months and cover the costs for “removing fiber cables and sealant from roads; milling and paving activities where needed; [and] removal of above-ground infrastructure,” Louisville Metro said. “Louisville Metro Government and Google Fiber agreed to these payments to fulfill the company’s obligations under its franchise agreement and local regulations, which require restoration of rights-of-way should a service provider end service in Louisville,” the announcement said. The city said it will repair the roads itself over the next 20 months. Google Fiber had been offering service in Louisville since late 2017. In addition to the $3.84 million payment, Google Fiber is donating $150,000 to the Community Foundation of Louisville’s Digital Inclusion Fund to support projects such as “refurbishing used computers for low-income individuals and the enrollment of public housing residents in low-cost Internet access through other companies providing service in Louisville.” Google Fiber will also donate 275 refurbished computers to the Louisville Metro Housing Authority. Google Fiber has said its decision to leave Louisville won’t affect the other cities where it offers service. Google Fiber’s micro-trenching approach in other cities reportedly buried cables at least six inches deep, preventing the problems experienced in Louisville. Google Fiber also hangs wires on utility poles, but incumbent ISPs have been able to slow down that process by filing lawsuits and by taking their time moving their own wires to make way for Google Fiber’s. After announcing its decision to leave Louisville, Google Fiber waived customers’ bills for their final two months. AT&T and Charter still offer broadband in Louisville.